(2 min read) We’re proud to announce that i2x has won a place on the German Accelerator Tech Program. The growth acceleration program supports German tech startups to enter the U.S market. It is privately-run by a team of entrepreneurs and investors and is supported through funding by the German government. Following on from our U.S. launch last month, the win is a big step in the direction of our expansion into the U.S. market. We are amongst 13 promising German tech startups that were chosen from a variety of firms in the round. 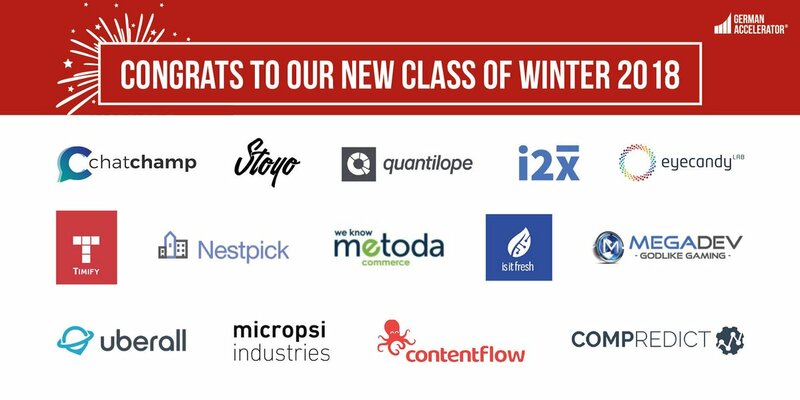 Together, we form the “Class of Winter 2018”. Ranging from fields as diverse as AI, gaming, robotics and software solutions - we reflect the exciting technology era of today. Starting in October, the program provides startups with hands-on support and free office space in the Silicon Valley, San Francisco and New York. We will grow new relationships in the U.S startup space, receive customized mentoring and workshops, as well as gain access to marketing channels in order to take our story stateside. German Accelerator Tech identifies and selects the most promising German startups and empowers them to successfully enter the U.S market. Founded by Dirk Kanngiesser, serial entrepreneur and venture capitalist, the program was launched in 2012 in the Silicon Valley in order to empower high-potential German tech startups to successfully enter the U.S. market. Companies are selected by an expert committee which evaluates all applications based on a predefined set of admission criteria. The accelerator’s vision is to build a bridge between Germany and the U.S that facilitates transatlantic startups, provides inspiration, and drives demand, innovation, research, and development in Germany. The program has already helped over 100 German startups define winning business strategies in order to succeed in the U.S. market. We’re proud to follow in the footsteps of other high-growth companies such as fellow Berlin-grown business, N26. Thanks to being selected, we’re looking forward to continuing to share the positive message of i2x across the world and provide smart, personalized insights to our users. We’re determined to use this opportunity to grow our reach in the U.S and help more people have better conversations, so that we can radically improve the relationship between companies and their customers. If you have any questions about our place on the German Accelerator Tech Program, feedback about i2x, or thoughts on our blog, get in touch at hello@i2x.ai or follow us on Twitter. We’d love to hear your thoughts.